Lil' Blog and More: Wordy.... Thursday? So sorry this is late everyone! I wanted to post it Wednesday, but got caught up at work, and getting some stuff done for my grandma. Above is a picture of a rose from the bush that gave Aaron Sporotrichosis..
Beautiful, but they can definitely be pretty dangerous I guess! What is Sporotrichosis? I know blackberry thorns can infect your fingers. Either way, lovely rose, sorry about the illness! It looks beautiful, not dangerous at all! What a beautiful rose! What is the spory....whatever that Aaron got???? I love roses, very nice picture. What a pretty rose! Love the color! That rose is absolutely beautiful! I miss seeing roses growing naturally around here. It's all covered in snow. It is gorgeous, but have no idea how it is dangerous. Is it blooming for you right now? So jealous. We just have rain and mud at the moment. My boyfriend was planting that rose bush and he was pricked by a thorn. That in turn gave him a fungal infection, known as Sporotrichosis. He then ended up needing surgery in his hand lol :/. 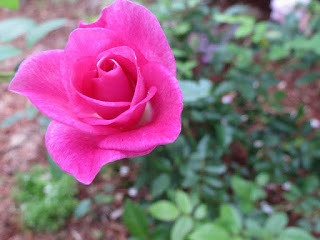 I love roses, that one looks beautiful. It is crazy how one little thorn can cause so much damage though. Hope your boyfriend is okay.